Members of the Youth Leadership Council at the ARVF office with Program Coordinator Bridget Murray after one of their monthly meetings. The MLK Day of Service is recognized every year on the third Monday of January as a day for individuals to work together in recognizing and solving problems within their community. Across the country, projects assisting a countless number of organizations, nonprofits and others will support those in need. Locally, the Alicia Rose Victorious Foundation is collecting donations for its Teen Kit Drive for hospitalized teens battling cancer and other life-threatening illnesses. These donations will contribute to the 500 backpacks the ARVF aims to fill on Monday, Jan. 21, at the Voorhees Town Center alongside hundreds of volunteers. The event is led in large by the nonprofit Youth Leadership Council, comprised of approximately 40 high school students from across South Jersey, who meet monthly to discuss how to get donations, recruit volunteers and plan out and later lead the MLK Day of Service events. 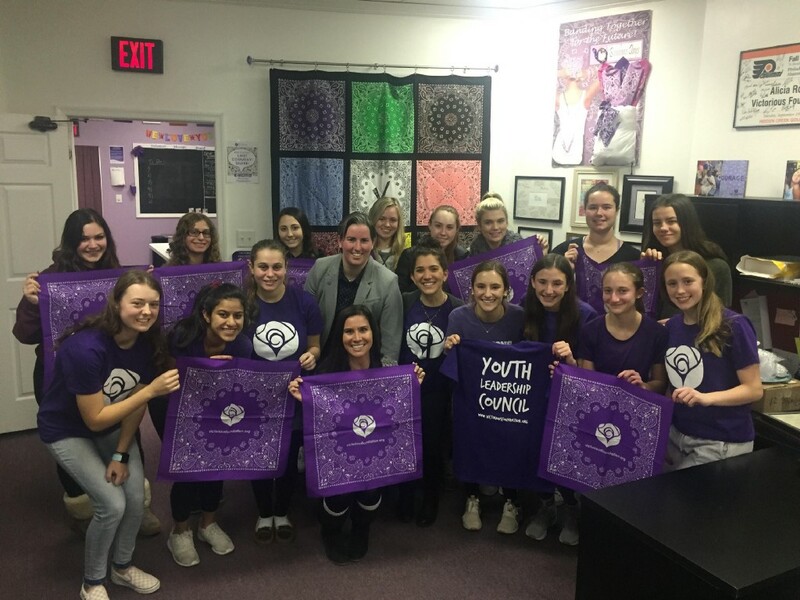 “A big thing about the foundation is to be teens for teens, so it’s all about getting them involved and then engaging their peers in not only the name of giving back, but also spreading the awareness,” Program Coordinator Bridget Murray said. One of the students in the Youth Leadership Council with ARVF is Angelina Roustas, a sophomore at Eastern Regional High School, who has been involved with the organization since kindergarten after originally helping first with her Girl Scout troop. Roustas learned how to sew while helping the organization to make bandana pillows. She originally had an interest in sewing since both of her grandmothers do it, however she learned how to about three years ago thanks to the ARVF. Kim Dickstein, an English teacher at Haddonfield Memorial High School, has served as a Youth Leadership Council advisor since 2009 and has done so alongside Murray and Dickstein’s sister, Katie Brotz, a teacher at Moorestown High School. Growing up, Dickstein was close friends with Alicia, whom the organization was founded in honor of after she passed away in October 2002, and has had a passion to help others in similar situations ever since. Dickstein highlighted how important the Teen Kit Drives are for the ARVF, as they can make a huge difference for hospitalized teens. The ARVF is asking for donations of one-ounce Tic-Tacs, boys and girls socks, lip balm and fabric markers specifically to put into the teen kits. Those interested in donating or looking to host their own Teen Kit Drive can go to the ARVF website at victoriousfoundation.org for more information.